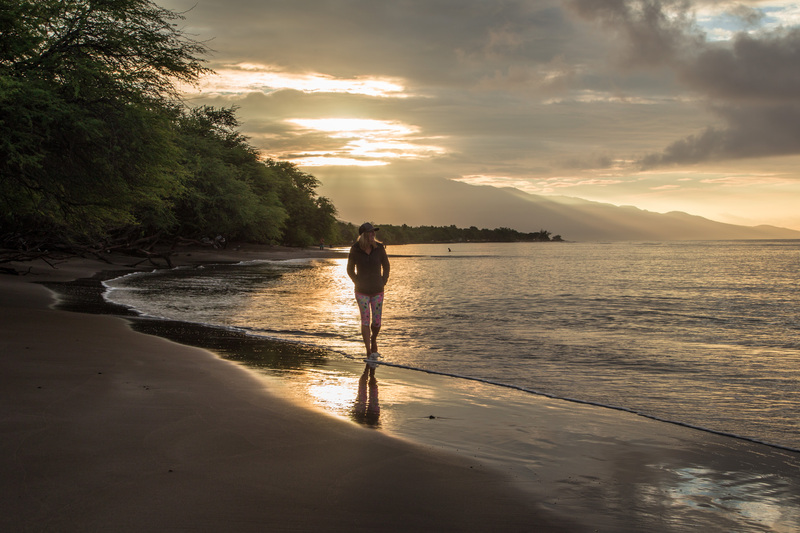 Throughout my fifteen day Hawaii adventure, I kept thinking to myself, is Maui REALLY all rainbows and sunshine? In my experience, it absolutely was…accompanied by an occasional passing shower keeping the green parts vibrant. 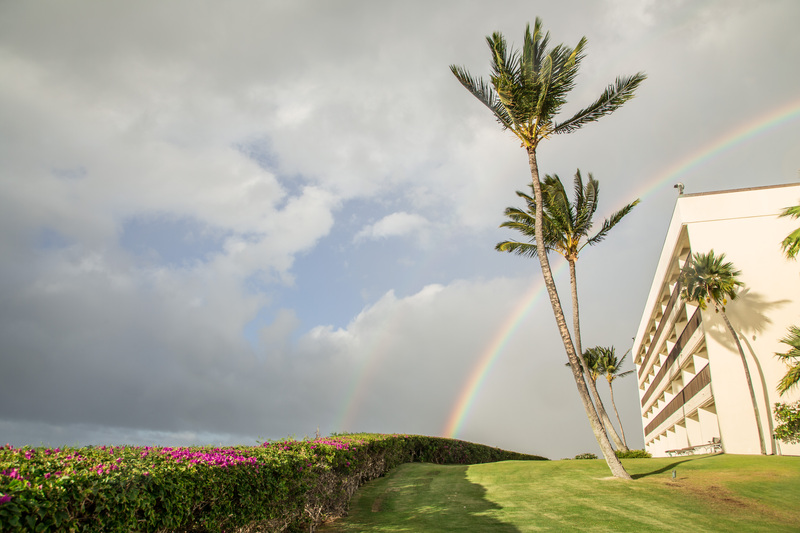 Windblown palms and double rainbows kept popping into my lens. 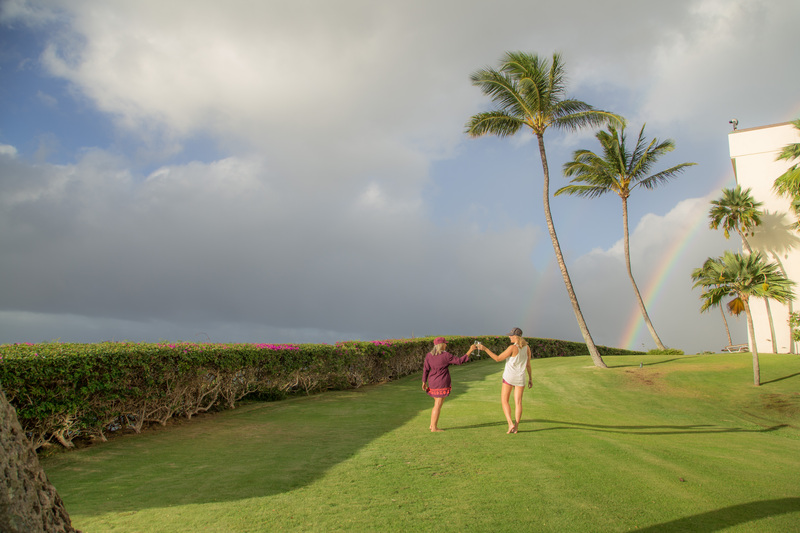 I was in Hawaii with SwellWomen producing two films about their beautiful retreats and could not have had a more enchanting experience my first time around. 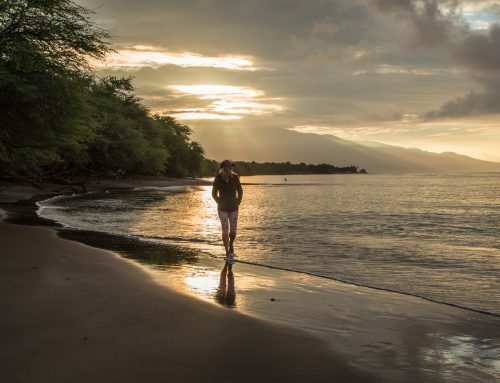 We stayed at the Sheraton Maui conveniently located on Ka’anapali Beach at the famous Black Rock. Lulu, owner of SwellWomen, and I celebrated on arrival with a bottle of champagne on the massive lawn in the Moana Hale. One of the great things about this hotel is the amenity ordering service where you can send special items like this to others staying on property- you can even send someone an in room massage. 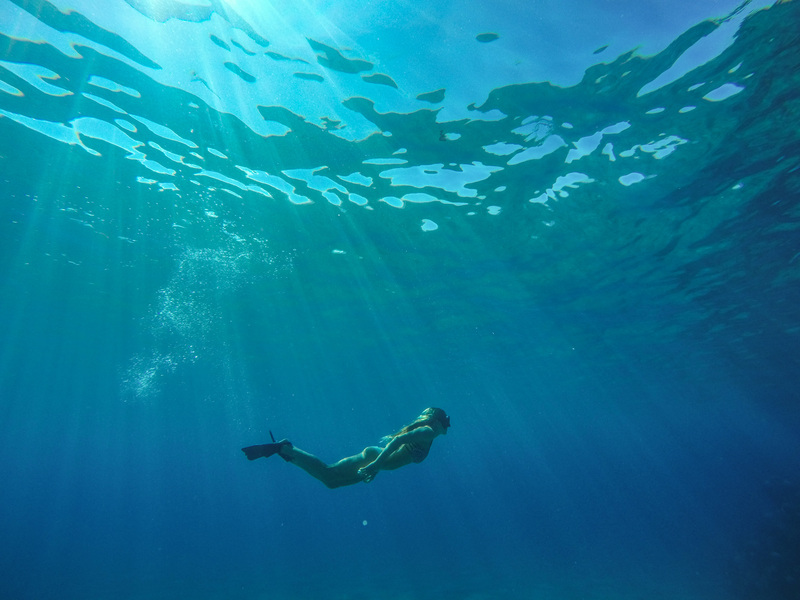 On day two, Jodel (my model/local surfer attending her second SwellWomen retreat) and I drove around location scouting for beaches where we could stage our underwater shots. After testing out two other beaches and viewing the results, we knew we needed something with a simple sandy bottom. Joel and I made our way down to the pool at Sheraton to relax and snorkel around. When we hopped in the water, we realized THIS was the location we had been looking for all along! The depth dropped off pretty quickly and once you make it out closer to the Black Rock, it’s all beautiful clear sweet and sandy bottom with out kickback from incoming waves. The lack of waves also made for great swimming and snorkeling without a big current and also for producing great cinematic moments. Some of the clearest water we swam and photographed in, I used the Go Pro Hero 4 Black to capture my images. I picked it up (after realizing I accidentally left mine at home) from Hi Surf and Sport just near the airport. I learned a few things while filming and photographing with the Hero 4 Black underwater. This prevents you from getting grainy shots as the is going down. I set mine at 1600 max. The Go Pro Hero 4 can film up to 120 frames per second in hd which can make for ultra dramatic and dreamy footage when slowed down in editing. This was one of my favorites. Start practicing before your trip and you’ll come up with much more creative angles. I learned that you can create much more dramatic shots when you’re lower than the subject like this photo we snapped at Black Rock. Depending on how you choose to set it, the burst mode can be your best friend for capturing that single amazing image. I set mine for 30 images over two seconds and fired away. After I made my way to the bottom, I would slowly float up to capture a series of different shots. After Jodel and I finished our photo and filming session, we swam around the corner and spotted a few sea turtles tucked in between the coral. All that swimming worked up a thirst. It’s not often that I actually get to sit back and relax. Because our days began so early, I had the pleasure of taking a few afternoons off and to lounge by the pool in-between snorkel sessions. 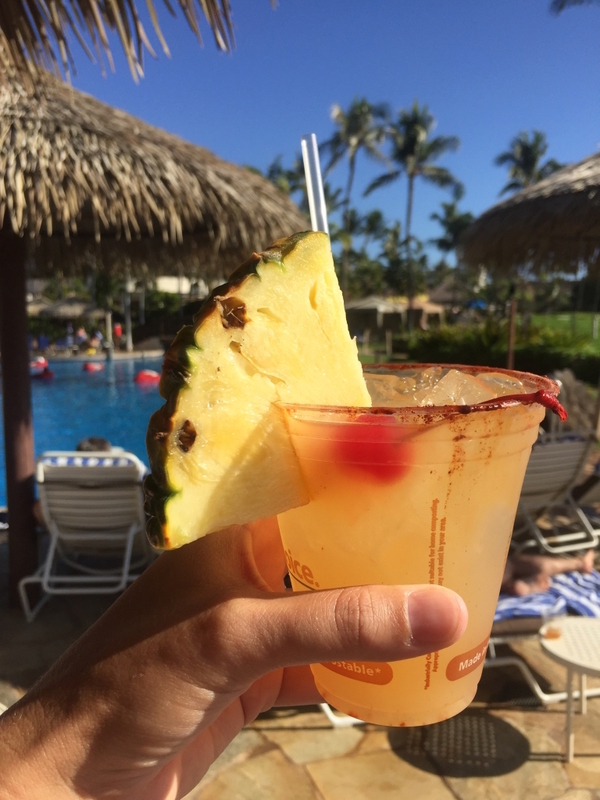 I fell in love with the Li Hing Mui – dried plum salt – that surrounded the rim of one of the margaritas I ordered. 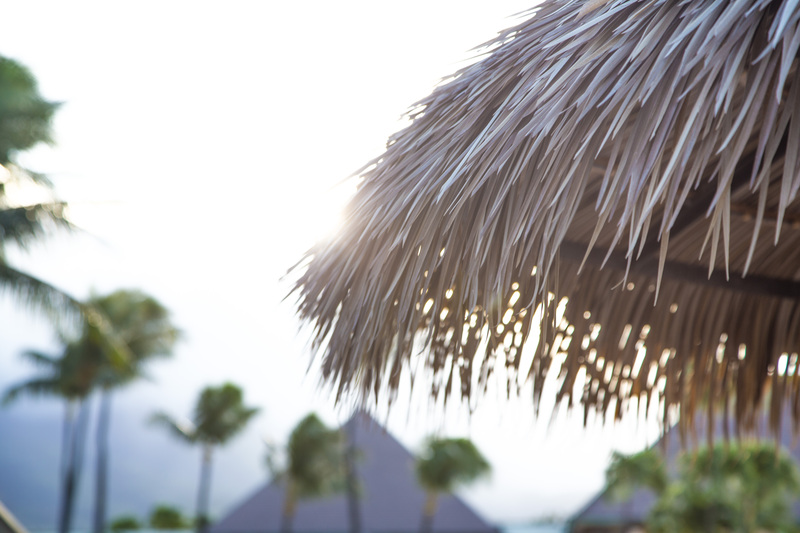 One of the great things about bigger resorts is the no need to carry cash – you can simply charge it to the room. And if you have an SPG card you can rack up points and receive some nice discounts on future stays. 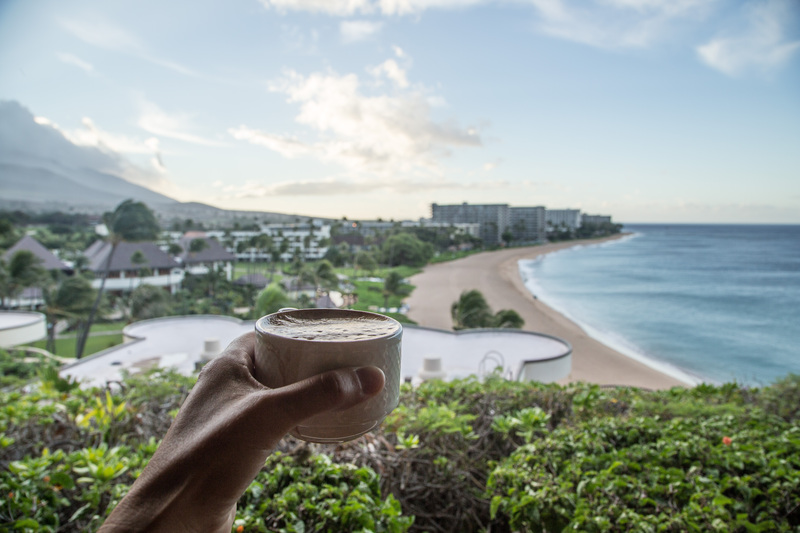 As a Starwood Preferred Guest (SPG) at the Sheraton Maui, you can also access the Na Hoku Guest Lounge in the Moana Wing above Black Rock. You have access to complimentary morning and evening snacks, beer, and wine and the most incredible views from here in the mornings for coffee before heading down to breakfast with the SwellWomen ladies. During the retreat, we got an early start to each day as the fifteen girls I was filming had to be in the water for their surf lessons with Goofy Foot Surf School by 7:15 am so we were well up before sunrise each day. The light beaming across the still damp lawn was a great way to see the early light. Crossing the bridge to breakfast became fun each morning as the coy swam through the water lilies. We never left hungry for morning surf lessons as Black Rock Kitchen breakfast had an insane amount of variety. 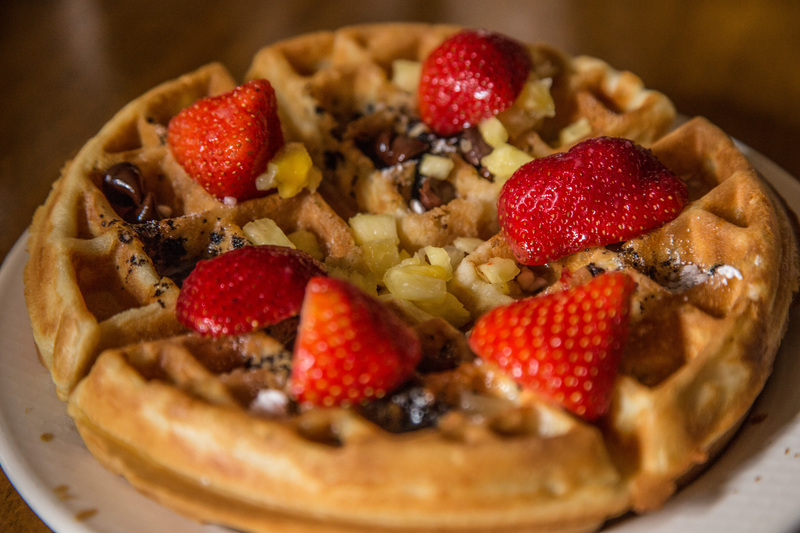 I especially loved making my own waffles topped with island fresh fruit on our last day. After a long days surf and filming it was really nice to come back to the grass lawn to catch the sun go down, whether from my patio or during sunset yoga. The lawn on the Moana Wing really gave the property a much more remote feel. 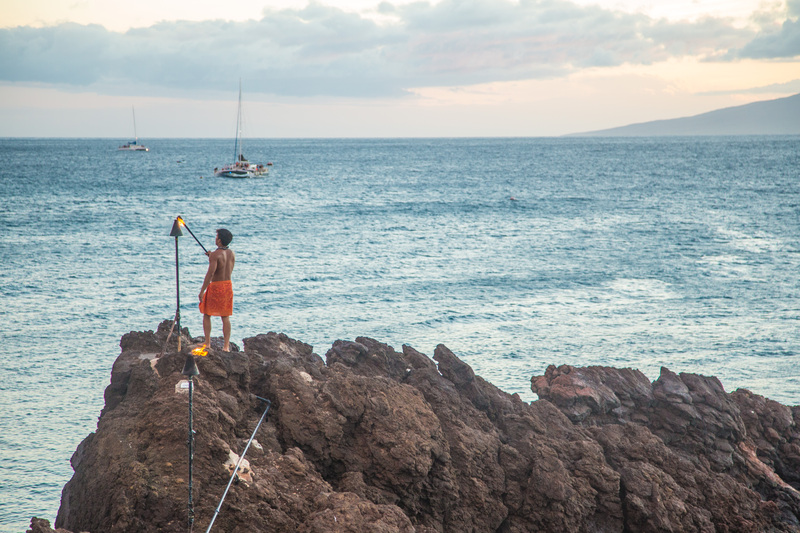 Perched above Black Rock, it was also just a few steps away from capturing the nightly ceremonial cliff dive at a different angle than guests staying down below. A property full of discovery, I loved being able to spend and share my time here with a group of spectacular women. Stay tuned for my second film on SwellWomen coming soon! Thank you Sheraton for hosting me for a portion of my stay. Steven Francois + Maui Digital Images for providing us with the stunning aerial footage.